I plan to make a dent in building the seat for the Chevy today, but first I had a few details to wrap up. Last year I got a set of Lie-Nielsen bevel edge chisels for Christmas. I picked out the 3 or 4 chisels I needed most, flattened and polished the backs and sharpened them. That left a lot of chisels standing in the wings, I finally decided to flatten the backs on all of them, re-doing the ones I’d previously done too as I wasn’t happy with the job I’d done. I finished flattening and sharpening them this morning, and I’m very glad to be done with that than-you-very-much! A few thoughts stand out in my mind. The most obvious is that if I never have to flatten another chisel or plane blade that would be OK. Second, the world needs a good sharpening jig. I have the Veritas Mark II and the Eclipse. 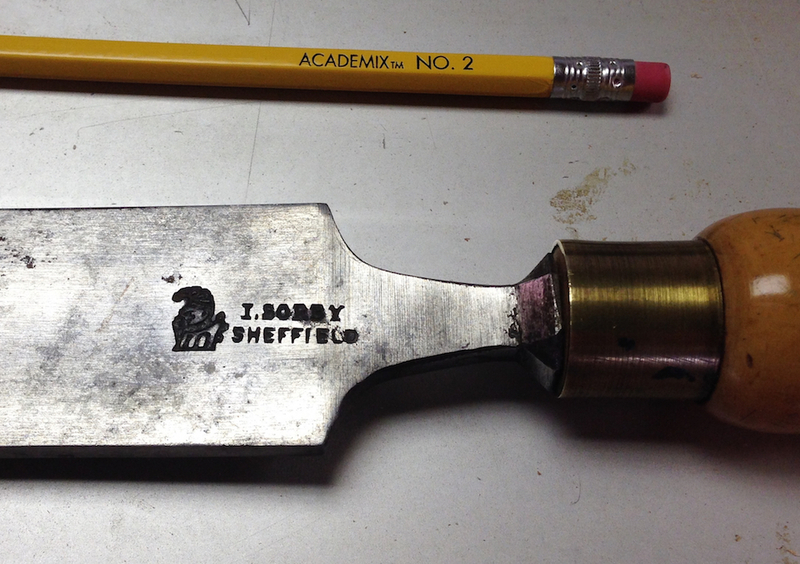 Suffice it to say that neither is what I would call a good sharpening jig. 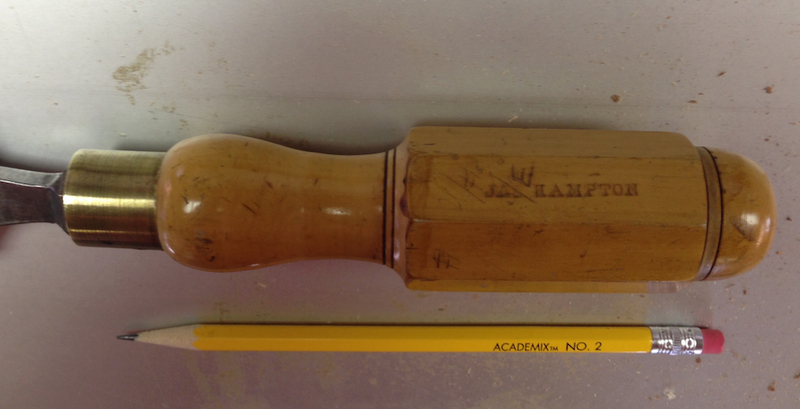 While I’m thinking about it, Jonathan at The Bench Blog asked about the London pattern handled chisel in the background of a recent post, so here are a couple of pics. It’s a big chisel, but frail thin. The blade tapers in thickness from maybe 5/16″ thick near the handle to 1/8″ at the start of the bevel. The bevel is a very low angle, and when I sharpen it I put I higher secondary bevel on it. The back could be flatter, but that’s a flattening session I’m not ready for. 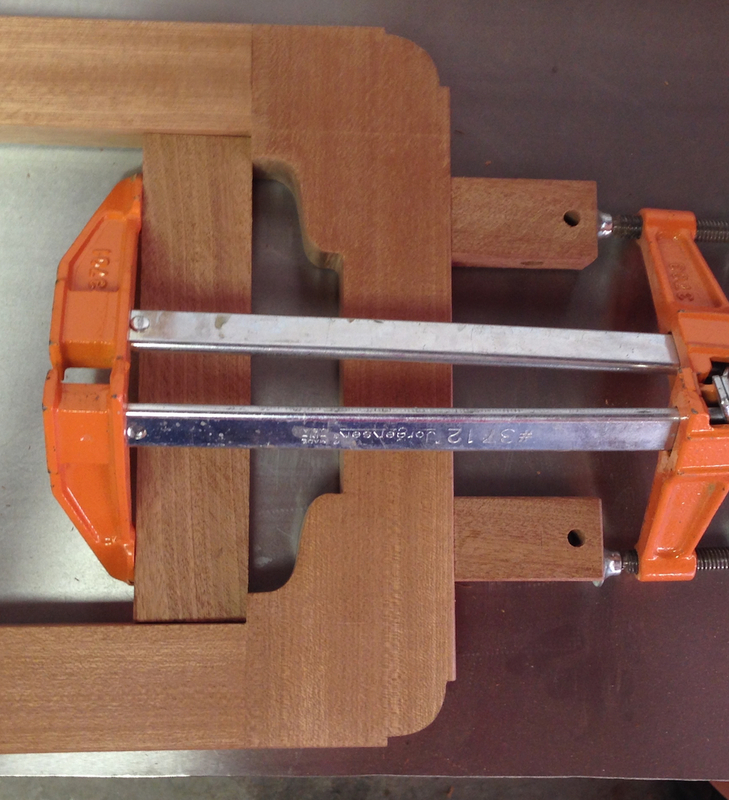 In other news, I wrapped up the last details on the saw frame, I feel pretty good about it. I tuned up all of the surfaces with a plane, followed by scraping. I also added a cove detail on the two outer corners. And I made and glued in the blocks that clamp onto the gimbal mechanism. I got a nice snug fit on the mortises, so with a little glue this should be plenty strong. I’ll give it a light sanding after I take the clamps off later and set it aside with the other finished parts. Gimbal blocks glued into mortises (the extra cross brace is just for clamping). The cove on the outer corners of the frame is done too. Which brings me to sawing the giant dovetail at the front of the seat assembly. I decided to make some practice cuts in an off cut and there are a couple of issues. 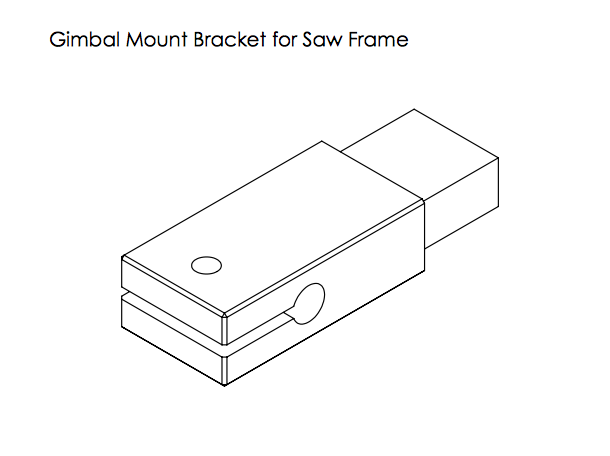 First, my dovetail saw doesn’t have the depth to go to the bottom, it’s at least 3/32″ short. The blade is also a little fine for a 1.75″ thick rip cut. 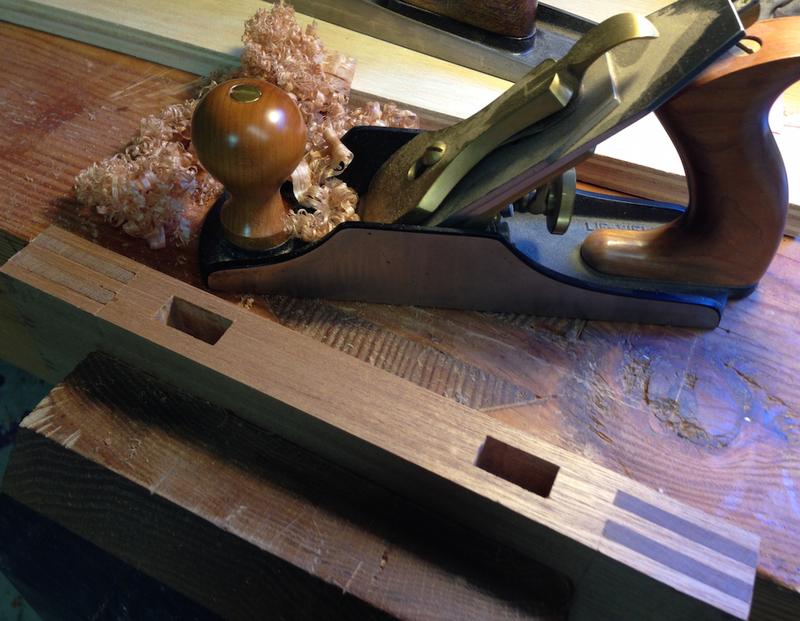 I can use my tenon saw, but it’s coarser than I’d like for a dovetail. I think I can make either work though. I saw “I think”, because I can’t actually see what I’m doing to make the cut. 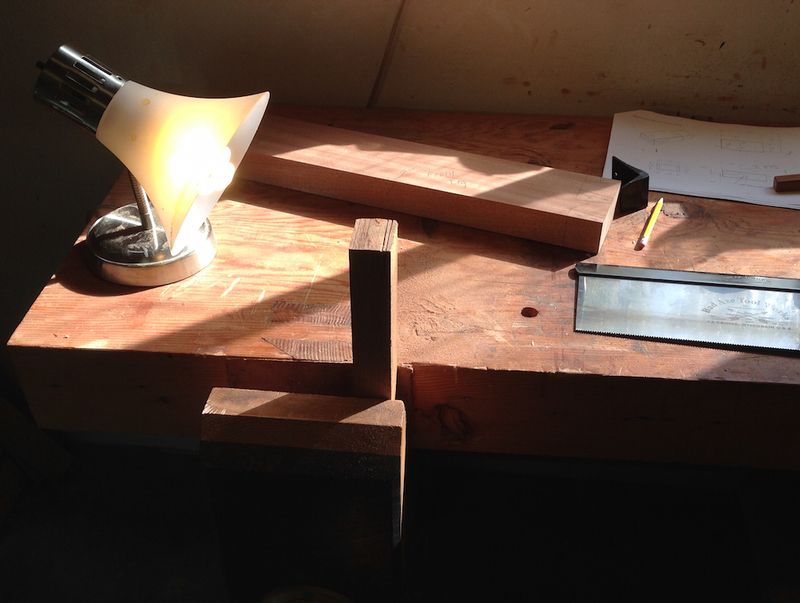 The sun coming through the shop window in the mornings is really bright, and the cut line is essentially invisible. The picture below gives you a sense of this. So while I wait for the sun to move I’ll grab lunch and then chop some of the mortises for this assembly. Where the heck is the line? Thanks for posting the pictures of the chisel. I really like the look of London pattern chisel handles. I’ve never owned one, so I can’t say that I like the feel of them, I just don’t know yet. I think that it would be a fun project to try turning some. I wonder if I contacted the manufacturer in Czech Republic if they would sell a whole set of various chisels, sans handle? They make bevel edge, firmer, skews, and gouges. It would be cool to have a whole set.